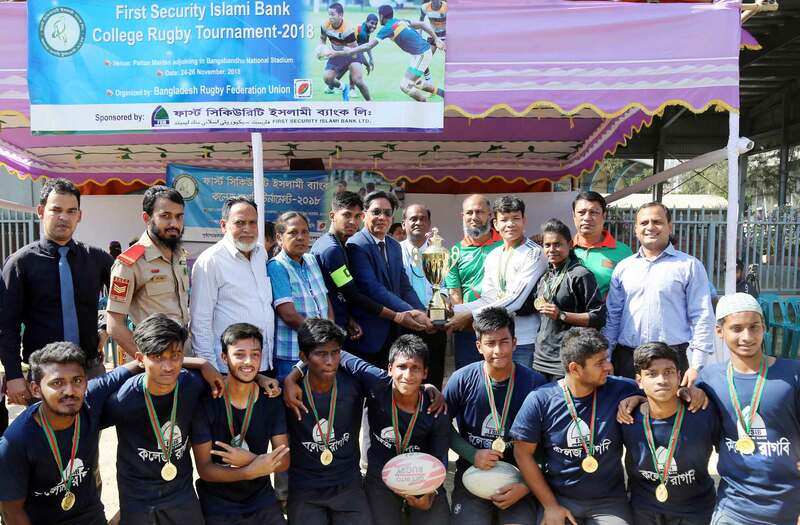 The final round and prize giving ceremony of the 9th First Security Islami Bank College Rugby under 20 (Boys) Competetion-2018 held at Paltan Field, Dhaka sponsored by First Security Islami Bank. The tournament champion was Kabi Nazrul College (Dhaka and runners-up was Haimchar Govt. College (Chandpur). Chief guest Mr. Md. Shah Alam Sardar, Joint Secretary and Director of National Sports Council and special guest Mr. Md. Masudur Rahman Shah, Senior Executive Vice President & Manager, Dilkusha Branch of First Security Islami Bank Ltd. handed over the prize to the winners. Mr. Moisum Ali, General Secretary, Bangladesh Rugby Federation along with other officials was present on the program.